Online booking only. Buscot Park will be open to theatre-goers from 6:30pm. Picnics welcome. Seating is limited to 50 per night so please book your seats early; consequently on Wednesday 15th May there will also be a special performance for FDS members and their families only. Performed in collaboration with the Garrison Little Theatre from Fort Erie, Ontario, Canada. GLT will have already completed five performances of this play in Fort Erie during April, before coming to us. 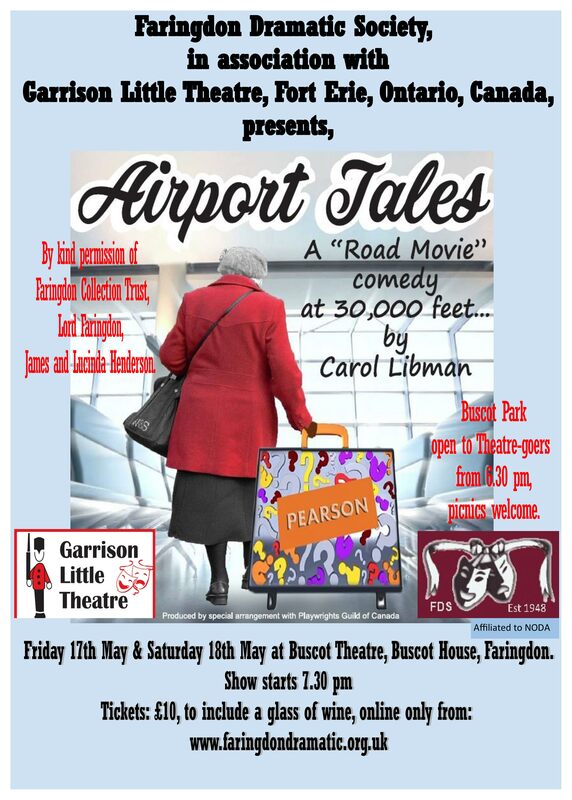 ‘Airport Tales‘ is a light-hearted, entertaining, funny and above all human onstage “Road Movie” … at 30,000 feet. The indomitable Evalina, journeying back to the old homestead to celebrate her 90th birthday, battles and conquers all the security checks, seat-mate problems, lost luggage and a somewhat fraught family reunion. GLT first came to Faringdon in September 2007 to perform ‘Lend Me a Tenor‘. Then again in October 2011 to perform a joint production of ‘London Suite‘, followed by ‘Office Hours’ in May 2015. We are looking forward to meeting them again this year for a fourth time. No reviews have yet been received for this production.